If asked to name a key pollinator in the United States, you’re likely to think first of the honey bee. Native to Europe, honey bees were introduced to North America during the 1600s and have been busily pollinating our crops and other plants ever since. But native bees play critical roles as pollinators as well, and among these indigenous insects, bumble bees are the champs. A bumble bee visits a coneflower in a Tennessee backyard. Photo donated by National Wildlife Photo Contest entrant Julie Chen. 1. Unlike most native bees, but like honey bees, bumble bees are social insects that live in colonies. Usually located underground, particularly in abandoned holes made by rodents, bumble bee nests contain between 50 and 500 individuals. 2. Except for new queens, which hibernate during winter, bumble bee colonies die in late fall. Queens overwinter in small holes just beneath or on the ground’s surface, emerging in spring to create new colonies they begin by laying eggs. Like honey bees, but unlike most native bees, which are solitary, bumble bees live in colonies of between 50 and 500 individuals. Photo by Elaine Evans. 3. Bumble bees do not produce honey, but pollination services they provide are worth more than that product would yield. Commercially traded bumble bees have become big business during the past two decades as demand for bumble bee-pollinated berries, peppers and, especially, hothouse tomatoes has skyrocketed. 4. Bumble bees’ wings beat 130 or more times per second. That ability, combined with their large size, enables the bees to perform a unique service, “buzz pollination” (vibrating flowers until they release pollen), that helps plants produce more fruit. The insects’ size also allows them to generate heat, so bumble bees can fly earlier and later in the day, as well as to cooler, higher altitudes, than can honey bees. 5. Bumble bees are in trouble. According to an article, “The Buzz About Bumble Bees,” in the current issue of National Wildlife, four once-common, widespread North American species have vanished from large portions of their former ranges. A fifth may already be extinct. Scientists report similar losses across Europe, South America and Asia. Bumble bees face many threats, including habitat loss, pesticides, introduced diseases, climate change and competition from honey bees, says Sarina Jepsen, endangered species program director for the Xerces Society for Invertebrate Conservation and deputy chair of the IUCN Bumble Bee Specialist Group. A new, not-yet-published analysis conducted for IUCN concludes that up to a third of North America’s nearly 50 bumble bee species are declining. 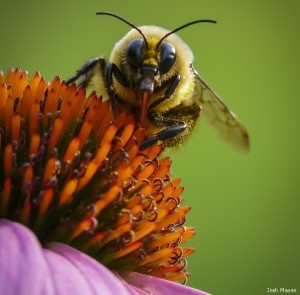 A pollen-dusted bumble bee feeds on coneflower nectar in an Ohio backyard. Photo donated by National Wildlife Photo Contest entrant Josh Mayes. Provide pollen and nectar for food. Active from early spring through late fall, bumble bees need access to a variety of nectar- and pollen-producing flowers so food will be available throughout all stages of the insects’ life cycle. Native plants are best because they have coevolved with indigenous bumble bees. Ensure bumble bees have nesting sites. 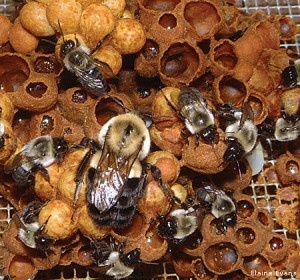 Most bumble bees nest underground in holes made by larger animals, while others nest aboveground in abandoned bird nests, grass tussocks or cavities such as hollow logs or spaces beneath rocks. In gardens, they may also use compost piles or unoccupied birdhouses. Both insecticides and herbicides should be avoided. In particular, steer clear of systemic pesticides such as neonicotinoids, which are taken up by the vascular systems of plants. This means bees and other pollinators are exposed to the poison long after a product has been applied when they feed on the plants’ nectar and pollen. Help scientists study bumble bees. Report the bees you see in your yard or community to Bumble Bee Watch, a new citizen-science project sponsored by the Xerces Society and five North American partners. May is Garden for Wildlife Month—the perfect time of year to establish or improve your habitat for bumble bees and other native wildlife.